SAKI serves up sardonic banter among these upper-class ladies vying for recognition having the best family ghost. "Mrs. Norbury, I shall take it as a deliberate personal affront if your clairvoyante friend sees any other ghost except that of my uncle." 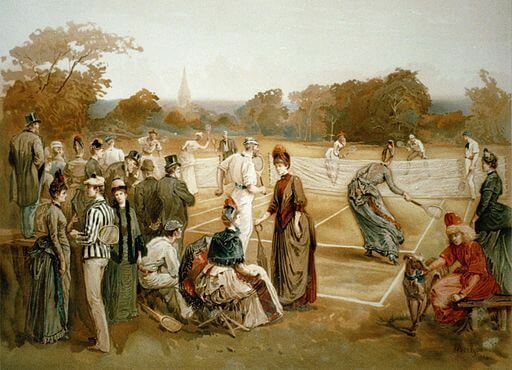 A "Mixed Double" of young people were contesting a game of lawn tennis at the Rectory garden party; for the past five-and-twenty years at least mixed doubles of young people had done exactly the same thing on exactly the same spot at about the same time of year. The young people changed and made way for others in the course of time, but very little else seemed to alter. The present players were sufficiently conscious of the social nature of the occasion to be concerned about their clothes and appearance, and sufficiently sport-loving to be keen on the game. Both their efforts and their appearance came under the fourfold scrutiny of a quartet of ladies sitting as official spectators on a bench immediately commanding the court. It was one of the accepted conditions of the Rectory garden party that four ladies, who usually knew very little about tennis and a great deal about the players, should sit at that particular spot and watch the game. It had also come to be almost a tradition that two ladies should be amiable, and that the other two should be Mrs. Dole and Mrs. Hatch-Mallard. "What a singularly unbecoming way Eva Jonelet has taken to doing her hair in," said Mrs. Hatch-Mallard; "it's ugly hair at the best of times, but she needn't make it look ridiculous as well. Some one ought to tell her." Eva Jonelet's hair might have escaped Mrs. Hatch-Mallard's condemnation if she could have forgotten the more glaring fact that Eva was Mrs. Dole's favourite niece. It would, perhaps, have been a more comfortable arrangement if Mrs. Hatch-Mallard and Mrs. Dole could have been asked to the Rectory on separate occasions, but there was only one garden party in the course of the year, and neither lady could have been omitted from the list of invitations without hopelessly wrecking the social peace of the parish. "How pretty the yew trees look at this time of year," interposed a lady with a soft, silvery voice that suggested a chinchilla muff painted by Whistler. "What do you mean by this time of year?" demanded Mrs. Hatch-Mallard. "Yew trees look beautiful at all times of the year. That is their great charm." "Yew trees never look anything but hideous under any circumstances or at any time of year," said Mrs. Dole, with the slow, emphatic relish of one who contradicts for the pleasure of the thing. "They are only fit for graveyards and cemeteries." "What is the score, please?" asked the lady with the chinchilla voice. "What an odious young cub Bertie Dykson has become!" pronounced Mrs. Dole, remembering suddenly that Bertie was a favourite with Mrs. Hatch- Mallard. "The young men of to-day are not what they used to be twenty years ago." "Of course not," said Mrs. Hatch-Mallard; "twenty years ago Bertie Dykson was just two years old, and you must expect some difference in appearance and manner and conversation between those two periods." "Do you know," said Mrs. Dole, confidentially, "I shouldn't be surprised if that was intended to be clever." "Have you any one interesting coming to stay with you, Mrs. Norbury?" asked the chinchilla voice, hastily; "you generally have a house party at this time of year." "I've got a most interesting woman coming," said Mrs. Norbury, who had been mutely struggling for some chance to turn the conversation into a safe channel; "an old acquaintance of mine, Ada Bleek--"
"What an ugly name," said Mrs. Hatch-Mallard. "She's descended from the de la Bliques, an old Huguenot family of Touraine, you know." "There weren't any Huguenots in Touraine," said Mrs. Hatch-Mallard, who thought she might safely dispute any fact that was three hundred years old. "Well, anyhow, she's coming to stay with me," continued Mrs. Norbury, bringing her story quickly down to the present day, "she arrives this evening, and she's highly clairvoyante, a seventh daughter of a seventh daughter, you now, and all that sort of thing." "How very interesting," said the chinchilla voice; "Exwood is just the right place for her to come to, isn't it? There are supposed to be several ghosts there." "That is why she was so anxious to come," said Mrs. Norbury; "she put off another engagement in order to accept my invitation. She's had visions and dreams, and all those sort of things, that have come true in a most marvellous manner, but she's never actually seen a ghost, and she's longing to have that experience. She belongs to that Research Society, you know." "I expect she'll see the unhappy Lady Cullumpton, the most famous of all the Exwood ghosts," said Mrs. Dole; "my ancestor, you know, Sir Gervase Cullumpton, murdered his young bride in a fit of jealousy while they were on a visit to Exwood. He strangled her in the stables with a stirrup leather, just after they had come in from riding, and she is seen sometimes at dusk going about the lawns and the stable yard, in a long green habit, moaning and trying to get the thong from round her throat. I shall be most interested to hear if your friend sees--"
"I don't know why she should be expected to see a trashy, traditional apparition like the so-called Cullumpton ghost, that is only vouched for by housemaids and tipsy stable-boys, when my uncle, who was the owner of Exwood, committed suicide there under the most tragical circumstances, and most certainly haunts the place." "Mrs. Hatch-Mallard has evidently never read _Popple's County History_," said Mrs. Dole icily, "or she would know that the Cullumpton ghost has a wealth of evidence behind it--"
"Oh, Popple!" exclaimed Mrs. Hatch-Mallard scornfully; "any rubbishy old story is good enough for him. Popple, indeed! Now my uncle's ghost was seen by a Rural Dean, who was also a Justice of the Peace. I should think that would be good enough testimony for any one. Mrs. Norbury, I shall take it as a deliberate personal affront if your clairvoyante friend sees any other ghost except that of my uncle." "I daresay she won't see anything at all; she never has yet, you know," said Mrs. Norbury hopefully. "It was a most unfortunate topic for me to have broached," she lamented afterwards to the owner of the chinchilla voice; "Exwood belongs to Mrs. Hatch-Mallard, and we've only got it on a short lease. A nephew of hers has been wanting to live there for some time, and if we offend her in any way she'll refuse to renew the lease. I sometimes think these garden- parties are a mistake." The Norburys played bridge for the next three nights till nearly one o'clock; they did not care for the game, but it reduced the time at their guest's disposal for undesirable ghostly visitations. "Miss Bleek is not likely to be in a frame of mind to see ghosts," said Hugo Norbury, "if she goes to bed with her brain awhirl with royal spades and no trumps and grand slams." "I've talked to her for hours about Mrs. Hatch-Mallard's uncle," said his wife, "and pointed out the exact spot where he killed himself, and invented all sorts of impressive details, and I've found an old portrait of Lord John Russell and put it in her room, and told her that it's supposed to be a picture of the uncle in middle age. If Ada does see a ghost at all it certainly ought to be old Hatch-Mallard's. At any rate, we've done our best." "At last I've seen something supernatural!" she exclaimed, and gave Mrs. Norbury a fervent kiss, as though in gratitude for the opportunity afforded her. "A ghost!" cried Mrs. Norbury, "not really!" "Was it an oldish man in the dress of about fifty years ago?" asked Mrs. Norbury hopefully. "Nothing of the sort," said Ada; "it was a white hedgehog." "A white hedgehog!" exclaimed both the Norburys, in tones of disconcerted astonishment. "A huge white hedgehog with baleful yellow eyes," said Ada; "I was lying half asleep in bed when suddenly I felt a sensation as of something sinister and unaccountable passing through the room. I sat up and looked round, and there, under the window, I saw an evil, creeping thing, a sort of monstrous hedgehog, of a dirty white colour, with black, loathsome claws that clicked and scraped along the floor, and narrow, yellow eyes of indescribable evil. It slithered along for a yard or two, always looking at me with its cruel, hideous eyes, then, when it reached the second window, which was open it clambered up the sill and vanished. I got up at once and went to the window; there wasn't a sign of it anywhere. Of course, I knew it must be something from another world, but it was not till I turned up Popple's chapter on local traditions that I realised what I had seen." She turned eagerly to the large brown volume and read: "'Nicholas Herison, an old miser, was hung at Batchford in 1763 for the murder of a farm lad who had accidentally discovered his secret hoard. His ghost is supposed to traverse the countryside, appearing sometimes as a white owl, sometimes as a huge white hedgehog." "I expect you read the Popple story overnight, and that made you _think_ you saw a hedgehog when you were only half awake," said Mrs. Norbury, hazarding a conjecture that probably came very near the truth. "This must be hushed up," said Mrs. Norbury quickly; "the servants--"
"Hushed up!" exclaimed Ada, indignantly; "I'm writing a long report on it for the Research Society." "It was very wicked of us, Miss Bleek," he said, "but it would be a shame to let it go further. That white hedgehog is an old joke of ours; stuffed albino hedgehog, you know, that my father brought home from Jamaica, where they grow to enormous size. We hide it in the room with a string on it, run one end of the string through the window; then we pull if from below and it comes scraping along the floor, just as you've described, and finally jerks out of the window. Taken in heaps of people; they all read up Popple and think it's old Harry Nicholson's ghost; we always stop them from writing to the papers about it, though. That would be carrying matters too far." Add The Hedgehog to your own personal library.